I'm looking forward to this one. There was also a mention of an alternate ending in one article I read on it--I am thinking it might be part of the new documentary rather than a standalone. Also, the DVD features are the same as the Blu-Ray. 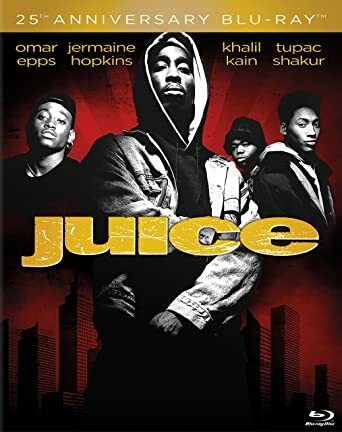 You’ve Got the Juice Now—A look back at the making of the film featuring brand new interviews with director Ernest R. Dickerson, producer David Heyman and actors Omar Epps, Khalil Kain and Jermaine Hopkins. The piece details Dickerson’s struggle to remain true to his original vision, his desire to cast fresh new talent, the challenges of shooting on location in Harlem, and the reasons why the film’s ending was changed. The Wrecking Crew—The film’s surviving lead actors talk about how they came to be cast in the film and the bonds they immediately formed with one another. They additionally share stories about Tupac Shakur’s drive, authenticity and unmistakable genius, as well as their delight at getting to work with Samuel L. Jackson, Queen Latifah and Cindy Herron. Sip the Juice: The Music—Explores the essential role that music plays in the film. Features vintage interviews with the Shocklee brothers about their score, as well as Erik B, EPMD, and members of Cypress Hill speaking about their contributions to the unforgettable soundtrack and why they chose to be a part of the film. Stay in the Scene: The Interview—Vintage interview with the four lead cast members on set. The piece demonstrates their rapport as they discuss the importance of the film and its message. Photo Gallery—Unit photographer Adger Cowans’ photos taken on set. View Next Unread How Many Blu-ray / HD DVD Movies Do You Own?